"The Italian flavors of tomatoes, herbs like garlic, basil and oregano are blended with a little cinnamon, sugar, olive oil and parsley to make a fresh saucy pizza base." 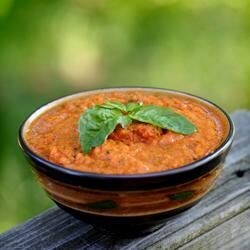 In a food processor, combine the tomatoes, garlic, basil, cinnamon, salt, pepper, sugar, oregano, oil and parsley. Blend without liquifying - should remain a little chunky. I didn't really like how this pizza sauce turned out. If you do make this I would leave the cinnamon out. We thought it ruined the whole sauce. I used 6 whole Roma tomatoes and added a teaspoon of red pepper flakes- the whole tomatoes and the red pepper added what the original recipe lacked. This was simply delicious. It was so easy to make and turned out extremely flavorful and colorful as well. Use big, ripe tomatoes for the best results. Overall, I highly recommend this recipe! !